Do u guys think that there will be deleted scenes of Gwen and Arthur kissing on the part 2 of series 5 DVD ?? if arthur and gwen went on a "date" (not really) , where should they go? how Arthur would react when ( or if) he finds out that lance and gwen kissed 3 years ago ? 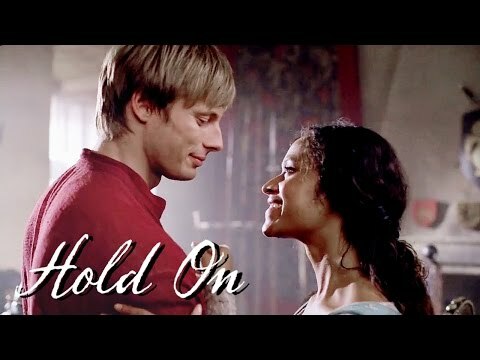 AU scenario , the hottest for arwen ? Help! My daughter and son in law to be absolutely fell in love with the 'Arthur and Gwen' theme tune and I am trying to find the sheet music for it so it can be played at their wedding at the moment they are pronounced man and wife. Can you help? 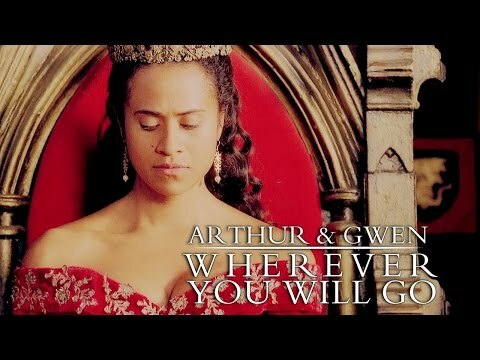 I herd Gwen Arthur betrays Camolt in season 5 is this true? hi! Does anybody know the height and perhaps the weight of Bradley and Angel? I thought I ask you guys here befoe I search the internet and find so many informations and don#t know what is right. Thank you! I was honestly okay with the ending. Given the state of the world and perhaps the limitations of what can be fed to and received by the audience at this time. What a tear-jerker. Honestly... I feel like writers, in their humanity, found themselves in too deep. Like to be able to write something so epic and ecstatic as what was to come when Magic flowed freely in Camelot.... was too much for the writers to handle or too much for the audience at this time to "handle" or both. Merlin gapes as he looks at Gwen. She looks stunning in a purple gown with gold embroidery. With her hair let loose around her shoulders, face enhanced with a minimum of make up, Guinevere looks absolutely beautiful. Sons Arthur, 16, and Ryan, 12. Daughters Jennifer, 15, and Rachel, 9. June 22, 2013. Guinevere’s 75th birthday. A/N: I know you all want me to go on forever with this story, and while it technically is possible, I just can’t. This chapter is a timeline of some significant events (not all, obviously) through history and how Arthur and Gwen react to them, leading up to the present-day epilogue. They move August 22. The house was ready that Wednesday, but they officially moved in on Saturday. Gwen wanted to start bringing things over little by little, but Arthur put his foot down. Gwen walks into her chamber and stops. She looks ahead at the table where a vase that had been empty a while ago is now filled with beautiful flowers. She looks down at her hands. She is holding fresh flowers herself, but the ones in the vase are more beautiful. Looks like someone has beaten her to it. “Do you like them?” someone asks from behind her, almost stunning Gwen. She whirls around and finds Arthur looking at her, smiling. She blushes and looks down. Gwen sits in a pew in the front, the only representative of the groom’s family, Arthur beside her, looking very handsome in his suit. Merlin sits behind them with Freya and the rest of their friends: Gwaine, Percy and Vivian, Leon and Mithian, and Duncan and Ezra and their wives. A/N: Thanks must once again go to withkissesfour for editing this chapter. I would also like to dedicate this chapter to her as it was her birthday last week! Happy Birthday withkissesfour! Merlin’s shoulders are shivering. He feels incredibly cold. Gwen is up early, too anxious and excited to sleep in. She takes a shower, comes back to their room, and sits down on the bed in her bathrobe, staring at the wall. A minute later her head finds the pillow and she is falling back to sleep. Short modern AU in six parts. "HE'S JUST ONE OF THOSE PEOPLE WHO NEVER SETTLE DOWN". Countdown to 1500 fans !! 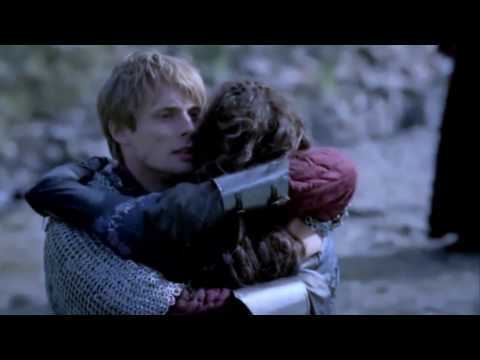 Re-watching Merlin 2x10 - "Sweet Dreams"
Re-watching Merlin 2x11 - "The Witch's Quickening"